A while back, CoolTools featured a nice looking bike rack that didn't take up much space, packed in the bikes, and allowed easy access. Mathowie and I must've seen it about the same time because he actually installed one while I just sat around thinking about it. After seeing Matt's installation, I started wondering whether I could hack one together. The main track looked a lot like a sliding gate track that I installed in our backyard. I poked around the Dero site and checked out their specs. I went down to the local Wilco store to see what they had on hand. 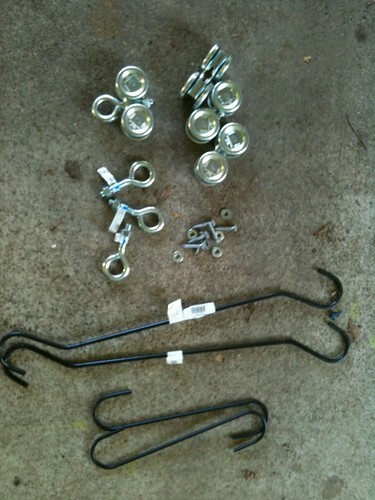 It looked like they had all the bits I'd need, so yesterday I made a quick run to the store and bought all the bits. It took about a half an hour to install, including drilling holes and standing around thinking about placement. So for just under $100, plus my own labor, I was able to build a DIY sliding bike rack in my carport with very limited space. The following pictures and videos will give you an idea of what transpired. 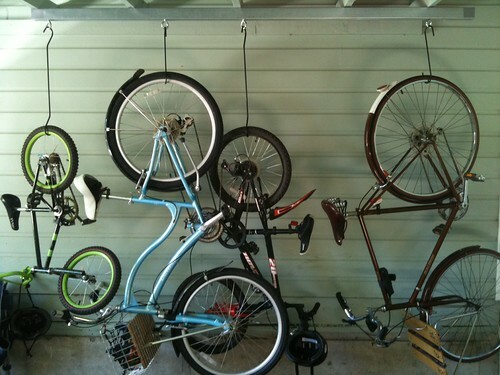 We have something like that at my work, but the hook that holds the tire is perpendicular to the track (like a hangar in a closet), so you can pack a lot more bikes along the length. Just like the Cool Tools link, now that I see it. We've been hanging our bikes this way in our basement for a couple years now, but recently I've been told by a number of sources (including Ye Olde Bike Snob) that hanging a bike by the wheel is a big no-no, primarily because it places all the weight on one small portion of the wheel. Is this a legit concern? A bike mechanic on that thread notes that hanging suspension bikes upside down can sometimes cause leaks in the suspension, so I guess that's something to consider. Not that there's anything wrong with these ideas, but an even cheaper, lighter and effective hanging system would just use angle iron with holes drilled in the one side and however many plant hooks you may need. Suitable for an area where the bikes would hang w/o blocking a usable space. Coventry cycles idea is clever.